After a tense Match 1, the rest of the games of the day were not close. Let’s quickly recap the games. This, the first game of the day, was also the strategically most interesting match of the group, with some unusual strategic choices made by Isurus and a stalemate position developing in midgame. So much the better, since reviewing this game allows us to bookend yesterday’s detailed overview of this matchup. Isurus draft Magnus, Rubick, PL with an SD in the first ban set and a 5th pick of Tidehunter. This was an unsurprising lineup for them; Nova wasn’t present, with prodigious13 filling in on Leshrac, and as discussed Isurus’s no-Nova lineup places Ifrit on the hard carry and Shoko usually on Magnus. I had noted in pregame that since both of these teams substantially favour Magnus, the team that had him would have scored somewhat of a coup. 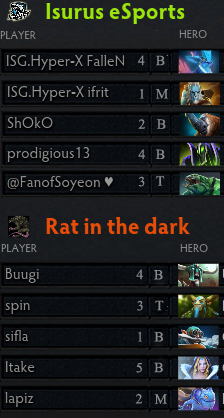 Rat draft Gyro, Nature’s Prophet, Undying and then Puck in the second phase, plus CM. The use of Nature’s Prophet and Puck for Rat wasn’t surprising and Undying was an interesting choice to try to get a laning advantage, but I questioned the pickup of the Gyro, a hero that I feel doesn’t play to Rat’s hard carry player sifla’s strengths and one that they hadn’t used in prior tournaments. Teams picking up Gyrocopter for dubious reasons became a theme in Group E play. The laning phase unfolds a huge surprise: Isurus elect to send PL mid against the Puck, with Magnus in the farmer slot bottom. This is an extremely unusual choice, intended to defuse the issue of the PL getting potentially bullied and outlaned in bottom leading to an insuperable farm deficit. Rat get first blood but it’s a Gyrocopter trade for Leshrac in the bottom, with the kill not going to Gyro either; they do, however, continue to bully bottom with periodic teleports from Nature’s Prophet and dives past the Tier 1 tower. I noted in yesterday’s writeup that this is how Rat loves to play in the lane: generally very safe, but with periodic coordinated dives to generate kill advantage. So far, so good for them, especially after adding a kill on Ifrit’s vulnerable PL in the middle. This gives Rat what they feel is a comfortable lead, and they seek to leverage it into farm for sifla’s Gyrocopter and spin’s Furion and tower kills. By 12 minutes game time Rat is ahead 5k gold including 2 towers. With a fairly easy solo lane, Tidehunter is well developed, but Gudii struggles early in the game to track down any Rat heroes to actually force into an engagement, and so Isurus’s massive initiation capacity from the Magnus and Tidehunter goes largely unused. Meanwhile, the exigencies of a difficult middle lane mean that PL doesn’t even start his Diffusal until after completing Tranquils, a Bottle (! ), and Drums. 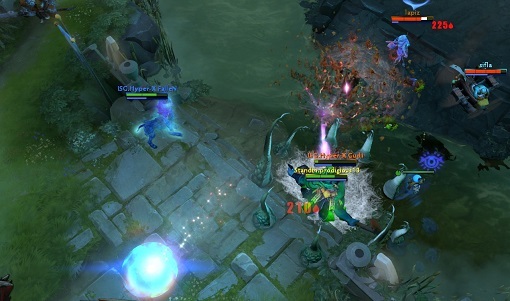 The game settles into a passive mode, with Rat happy to run up the gold differential by adding on a Roshan at 19 minutes to their already advanced farm. However, the lack of sense of urgency from Rat is somewhat concerning. PL’s only died once- in fact, there are only 6 kills on the board altogether by 19 minutes- and it’s not clear that Rat are seeking to end the game before he becomes a major threat. The first true engagement immediately follows Rat’s Roshan. RP and Ravage both land (the latter only just), but Isurus only manage to get Puck and CM, plus Aegis, to trade for Tide and Rubick. With Blink on the board for Magnus and Tide, plus Puck on Rat’s team, Isurus make their second bold strategic choice of the game. Noting that Rat, despite accumulating good farm and pressuring outer towers, seem to be at a lackadaisical pace vis a vis actually ending the game, Isurus decide that they might as well look to go late as well. Very late. Very, very late. They start to clandestinely build Refresher on both Shoko’s Magnus and Gudii’s Tidehunter while Ifrit continues to build standard PL-for-lategame. Rat are still ahead, and will be for some time yet, but the game is at this point thoroughly slotted into one of their weaknesses: converting an extant but not dramatic lead into high ground and rax. By 26 minutes into the game Isurus are down by 4 towers (1 outer to 5 outer) and lose their final outer at 30, but Rat continue to assiduously avoid attempts at conversion to highground, and PL, playing carefully and safe, hits his Heart around that time. Displaying strong flash farming skills, both Shoko and Gudii hit their Refreshers around 36-37 minutes. At this point PL has added a Butterfly onto his total, and with Rat still totaling 0 actual highground attempts despite having a very powerful Nature’s Prophet ostensibly capable of split pushes, the story of Match 1 is almost written. To the dismay of LD and Bruno, cocasting the game, Spin on Furion never makes a particularly concerted effort at a split push. Despite BKBs on Gyro and Nature’s Prophet and a Hood on Undying, the 20-kills-in-in-first-38-minutes game is blown wide open in the first engagement after the Refreshers come online. When their ensuing last-ditch Roshan fails, Rat are all but ready to tap out, and do so shortly thereafter as PL and co. blow up each set of rax in turn. Game time: 46:16. MVP: Isurus’s Shoko ran with a very weird lane setup and excelled time after time again on his Magnus, more than once using Blink+Skewer to attain absolutely free kills without even spending RP. Overall, despite an early lead Rat seemed incapable of showing what makes them excel as a team, while Isurus showed us exactly their strengths: patient, careful tactics combined with inventive and even cheeky strategy (two Refreshers!). Gyrocopter is a great carry, one of the preeminent choices in the Western scene right now, but I would have loved to see sifla piloting one of the more out-and-out hard carries he has in his pool and seeking to overwhelm PL that way. More damning, Rat took an advantage and an extremely farmed Furion and did nothing so far as push with it. Perhaps tournament jitters were to blame, or perhaps Rat underestimated the flash farming ability and patient play that Isurus were ready to deploy, or perhaps they just need more top-level practice with their post-Jerax lineup. Either way, a small upset started off Group E action; unfortunately, it was the first and last game of the day where the outcome was murky for any length of time past draft. The rest of the matches in Group E were less interesting and so we’ll rush through them. Fnatic.NA vs No Tidehunter: In Fnatic.NA’s second big-stage tournament appearance after their Bigpoint Battle fixture with TL, NTH gets 20 kills in 20 minutes and Fnatic.NA’s fountain gets one. Probably not the début they envisioned. As part of a Group E common theme, Fnatic.NA unsuccessfully deployed a Gyro (in the #2 slot, this time). 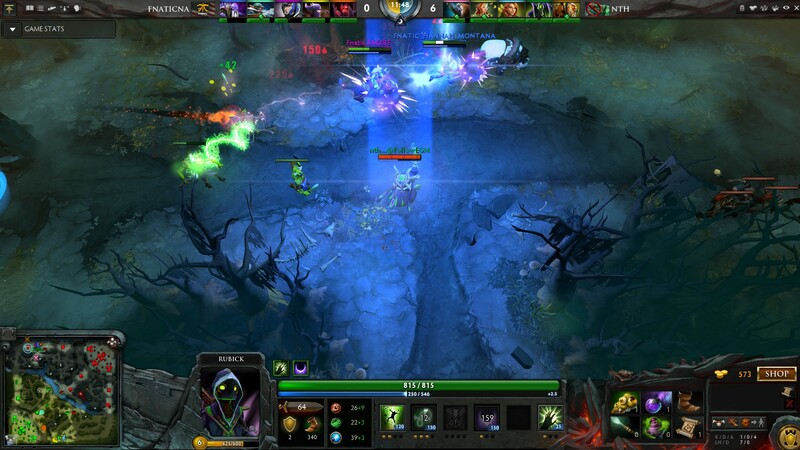 MVP: NTH’s EGM, on Rubick, generated a mass of kill opportunities, picked up an early Urn of Shadows that saw abundant use, and stole and deployed Eclipse from Fnatic.NA’s Luna three consecutive times. Fnatic.NA vs Rat in the dark: Forestalling possible humiliation, Fnatic.NA bounce back in their second game of the group. While Rat do score Magnus in this go-round, they once again plant sifla on Gyro, this time locking it in with the other of their first two picks. Fnatic.NA are abundantly prepared for this approach and draft a dual-core Lifestealer and Weaver, backed up by roaming SD + Rubick, and Hannah_Montana’s excellent Dark Seer play in mid, that will make it extremely difficult for sifla, even with very solid farm throughout the game, to actually get any kills. After a quiet beginning, Weaver begins to assert himself, and rockets to 4-0-2 by 15 minutes that begins a reign of terror over Rat’s team comp. MVP: Fnatic.NA’s MSS played a hyperaggressive Weaver that took the Finns completely out of their comfort zone and was eminently difficult to catch with Magnus, Clock, or Veno lockdown. Isurus Esports vs Fnatic.NA: With NTH locked in 1st place, the largely Spanish-speaking Twitch chat audience turned their hopes to this match for second place in the group and advancement through to the next stage. Unfortunately, although a clearly rattled Isurus did draft up some of their favourite heroes in Ifrit’s Storm Spirit, Shoko’s Magnus, and Gudii’s KOTL, they took Loda’s trollish Armlet Dragon Knight play as a cue to attempt same, and ran face-first into the first CK/Wisp play of the tournament executed near-flawlessly by Fnatic.NA from the laning phase onwards. 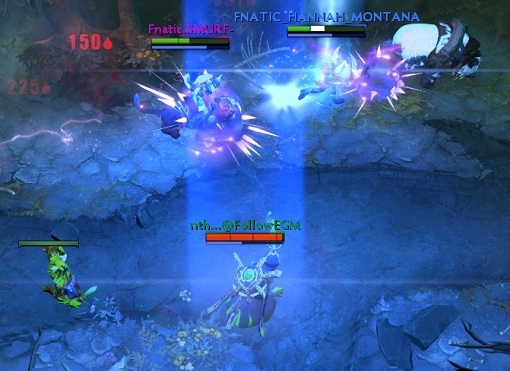 MVP: While the CK/Wisp play from MSS and Ego was flashy and well-coordinated, Fnatic.NA’s HANNAH_MONTANA most impressed me with his critical execution of the farming #3 role. By beating Isurus’s Ifrit handily to his Orchid, he tipped the Storm/QOP fulcrum early and thus completely held down a hero that could otherwise generate serious issues and possibly spearhead a comeback. PS: In case you were wondering, yes, there was a Gyro in that last game, and yes, it was on the losing team, this time as a #4, making for a full 5/5 games, across 3 teams, occupying 3 different positions, that Gyro didn’t deliver on the day. This isn’t necessarily commentary on the hero- to me, it’s more baffling that both Isurus and Rat would try to force the Gyro meme so hard given that they don’t typically favour him otherwise. Just because a tournament might be a bigger stage doesn’t mean you have to play exactly the picks of the big stage teams; it can be argued that instead as a newer and less known team you should play exactly to what you know to maximize your familiarity and minimize stage fright. Let’s transition to talking about today’s games. At 1700 CET today (17 March), the WePlay tournament moves to Group A play, kicking off with Na’vi vs Eosin+4 followed by Imperium vs Vivacity. My information about this group is incredibly spotty, so while it’s pretty clear who’s going to take first, there are two teams about which prediction is going to be difficult to impossible, and potentially more than one fairly close downticket matchup. I’ll share what I know. Na’vi: When ARS-ART/Smile and LightOfHeaven were muscled out of the #5 and #3 positions to make room for the addition of Funn1k from Empire and Kuroky from Mouz, I was skeptical if not borderline hostile about the change. Why dump the two players that seemed from the outside to be the most consistent, dependably high-quality performers? Why beggar 2 other excellent teams just to prop up one with a strong legacy that nonetheless seemed to be dipping into a lacklustre shadow of its former self? As can be common in eSports, I underestimated the psychology. Perhaps we’ll never get good details of what was failing Na’vi in the past team dynamic, but since the roster change, the three incumbents (Xboct, Dendi, and Puppey) have been playing with a renewed spring in their step, aggressive, playful, and scary as hell to oppose. It’s important to remember in any discussion of how Kuroky and Funn1k are slotting in that there are preexisting friend networks that the roster change leveraged: Puppey and Kuroky go way back  and Xboct and Funn1k are also tight friends. The new Na’vi is not without vulnerabilities but they’re easily on a shortlist to win the tournament and the days when they might drop a game to the calibre of teams they’re paired against in this group stage are in the rear-view mirror. Eosin+4: For what it’s worth, on a pure MMR basis Valve rates Eosin+4 among the very best. Being composed of 4 North Americans and a Euro makes it even more difficult for the team to play together and practice on a regular basis than it already would be for a semi-pro team with coordinated timezones, so their weakness lies in the fact that most of the ‘practice’ they get comes in the form of actually participating in tournaments, rather than scrimming constantly or what have you. This is certainly a substantial handicap, but natural talent has managed to get them placements in tournaments like GosuCup (where they beat Brazilian hopes Pain Gaming before falling to ROOT) and DotaCinema’s Smoke of Defeat (where they won the whole thing). And they’ve taken games off Dignitas in small-scale tourneys- no mean feat. Imperium Gamers: Imperium Gamers is a relatively new Polish eSports organisation that signed the Polish amateur team Down Them All. Down Them All doesn’t have many high placing tournament fixtures- about all they’ve done that’s earned notice from the major match trackers and sites has been to lose to AL.Main in a Raidcall EMS One grinder- but, to their credit, has maintained a fairly stable roster and plugged away for almost half a year in a world where even top tier pro teams drop like mayflies. Another thing I like about Imperium is that they obviously practice; their members are extremely active in TMM together. From what I can glean in their match history they really like Wisp, really like Lifestealer, and really like using them together. So, an Eastern European team through and through. I’m less optimistic about their overall robustness thus far; if Wisp cops one too many first phase bans or Lifestealer gets countered, especially if they find themselves staring into Na’vi’s recent Storm Spirit fetish, Imperium could be on the wrong side of a stomp. Vivacity Esports: Vivacity is an organisation that appears to have started out, bafflingly enough, in the 3D Dota clone Smite  before deciding to host an open call for a Dota 2 team that ended in them signing the mixed-Russian/Belarus team Oslyk Gaming. This crew has some bona fides, having captured good results at some of the semi-pro competitions that have been springing up like the Adroit Tt Esports Weekly 5 (they won) and the Alienware Cup 30 (they placed second behind Lions’Pride in a field that included Fnatic.NA, FOTA, and Eosin+4). Additionaly, their #5 player Alba has been around the scene for some time, with stints in some revolving-door CIS teams like XX5. The rest are largely untested kids, but promising, with their presumptive mid player ggSanta loading up on even public matchmaking games with QOP, Puck, Storm, and Nyx over the past couple days. 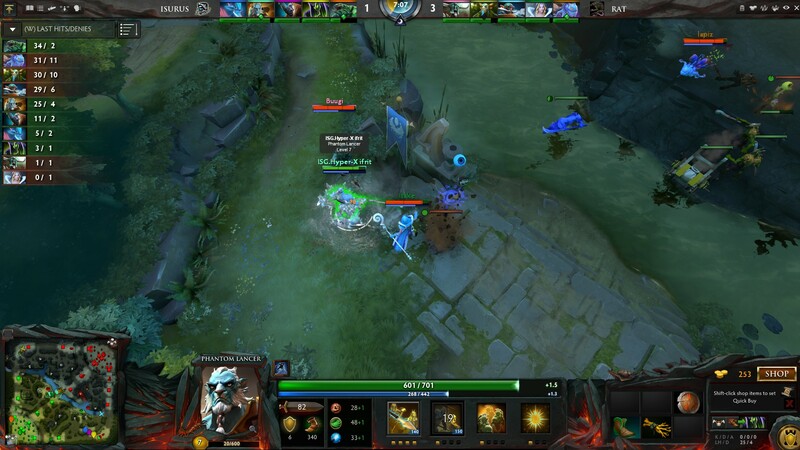 Match 1: Na’vi vs Eosin+4: Eosin, of +4 fame, doesn’t seem too confident. Na’vi. Match 2: Imperium vs Vivacity: Due to poor information density I can’t really call this much more than a toss-up. Vivacity have better recent results to show, while Imperium seem by all appearances to practice together more. Both are important for successful teams. Look towards the mid lane matchup between mnick from Imperium and either ggsanta or __brain from Vivacity to be highly determinant of the way the game turns. In the end, I’d tip this to Vivacity, especially if Imperium’s highly-favoured Wisp finds its way into the initial bans. Vivacity. 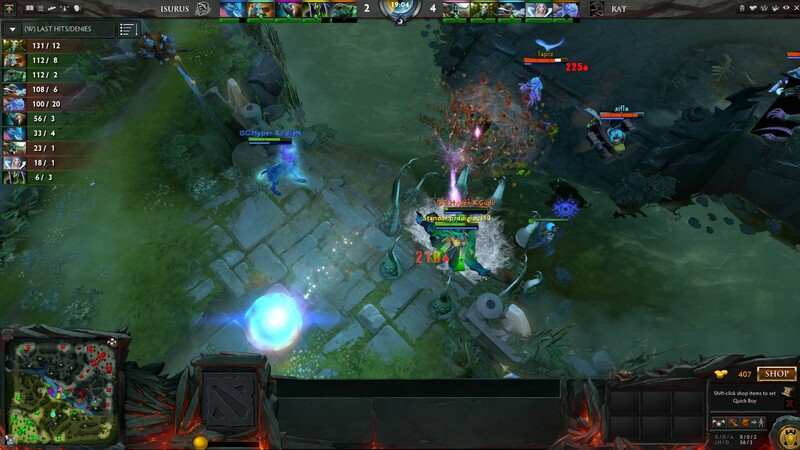 Match 3: Na’vi vs Vivacity: Either Dendi, Xboct, or both get a double digit number of kills and no more than 1 death. Vivacity still walk away happy, because you can only be so mad at losing to Na’vi as a recently uplifted semi-pro squad. Na’vi. Match 4: Eosin+4 vs Imperium: I think Eosin take this one on raw playskill. The two teams have never faced each other, but Eosin+4 just bring more at each position and have played together just as long as Imperium. An upset isn’t impossible but isn’t epxected either. Eosin+4. Match 5: Eosin+4 vs Vivacity: The game to determine who advances out of the group behind Na’vi should be an interesting one no matter the two participants. I think the explosive style of play favoured by teams from the region Imperium and Vivacity hail from- #rusdoto- is well suited to best of 1 matches due to its inherent openness and higher risk/reward, but Eosin+4 have, aside from Alba, been doing this for longer and should have a good idea by this game of what they’re looking at. A major complicating factor in this group may be which server games are played on, with 3 teams around Russia and just the one set of mostly Americans. Eosin+4, though I reserve the right to say I wasn’t wrong if they end up dropping to 3rd or 4th via having most of their games on EU.East or something. Again, watch the games today, starting at 1700 CET (12PM EDT), on Beyond The Summit. Or buy the tournament ticket on the Dota 2 Store. For a live stream of my blather, occasionally check out my twitch page. Kuroky’s more-or-less love letter to Puppey is one of the most guileless and emotionally appealing eSports-related readings out there. I have nothing against Smite, it’s a pretty good game. 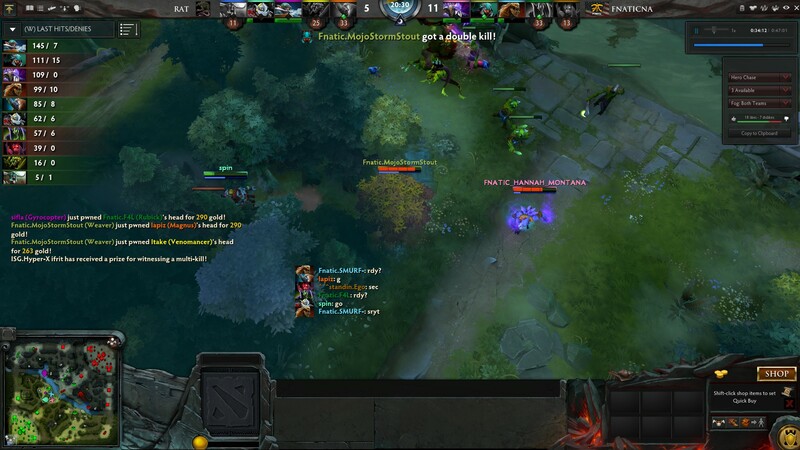 This entry was posted on Sunday, March 17th, 2013 at 12:07 pm and is filed under dota, video games. You can follow any responses to this entry through the RSS 2.0 feed. You can leave a response, or trackback from your own site.